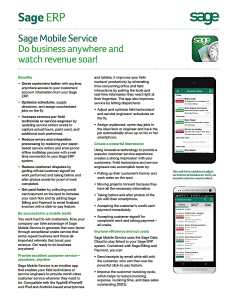 Sage Mobile Service is an intuitive app that enables your field technicians or service engineers to provide world-class customer service wherever they need to be. Compatible with the Apple® iPhone® and iPad and Android-based smartphones and tablets, it improves your field workers’ productivity by eliminating time-consuming office and field interactions by putting the tools and real-time information they need right at their fingertips. Using innovative technology to provide a superior customer service experience creates a strong impression with your customers.